A couple of weeks ago an awesome reader sent me an e-mail about an auction for this sign. As you might expect, I just had to have it. Too perfect to pass up. 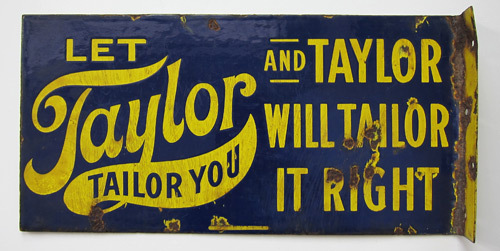 The sign is from the early 1900’s, and while I can’t find much information about its origin, I believe it was from a company called J.L. 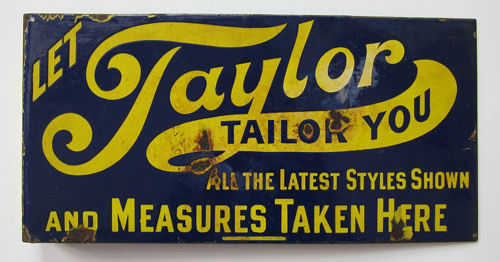 Taylor & Co., which was a custom-made clothier in New York and Chicago. If anyone knows more about this company, I would love to know. I’m going to proudly hang this up in my sewing studio this week…and then get back to work on my jacket pattern! A whole month has gone by since the last update on my jacket patten, but I promise I really am working on it. A couple in-progress pictures are below. Currently I am working on the lapel roll line and collar. 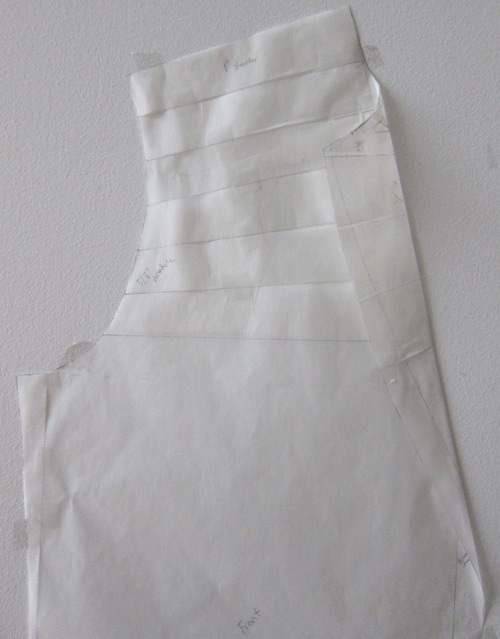 In addition to having less time to work on the pattern lately, the added complexity of jackets makes the drafting process more time consuming than the other patterns I have made. In my research on jacket drafting I came across this video, which talks about the process a cutter/tailor goes through in precisely recording every detail of the human body, and how he/she then translates that information onto a paper pattern that can be altered and modified over time. As Nina in the video says, these patterns tell stories. They aren’t just bits of paper. Sometimes good stories can take a while to develop. Negative Space from FUMF on Vimeo. 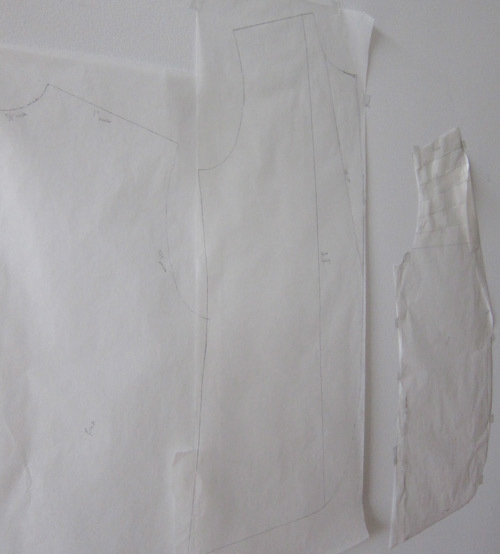 This is the first of what I hope to be a whole series of posts on each step I go through to make a jacket, from drafting the initial pattern to the finished garment. 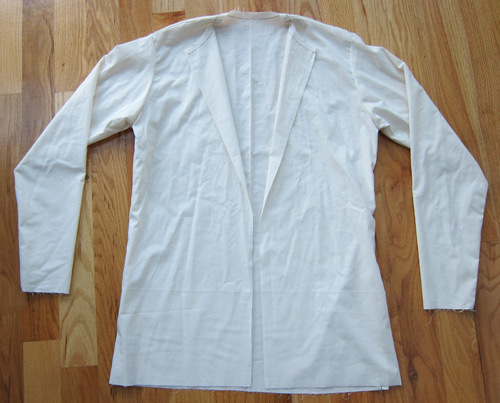 I finally completed a working version of a men’s jacket sloper, which is what I consider the first step. 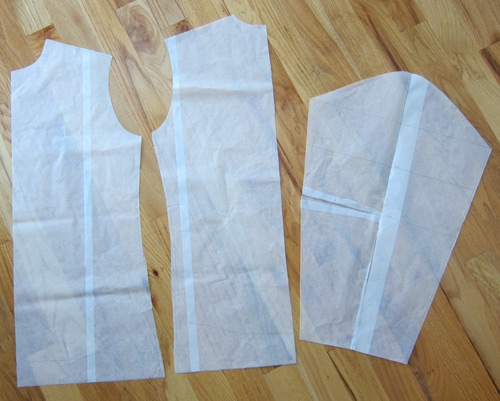 This is a simple pattern with a front, back, and sleeve to establish the general shape of a jacket. None of the details that you would expect to find on a finished pattern such as pockets, side panels, lapels, collar, lining, etc., are on this version. I tested the pattern in muslin and the fit is pretty good for a first attempt. Depending on what I end up doing with the lining, I might need to add some ease and drop the armhole a little bit to allow for any added insulating layers. Initially I was going to keep this a really simple, single layer, lightweight jacket, but with the temperatures dropping this fall, I’m tempted to try and make something that will keep me warm in colder weather. As soon as I get this sloper tweaked to perfection, I’ll start adding all of the details that make it a real jacket pattern. 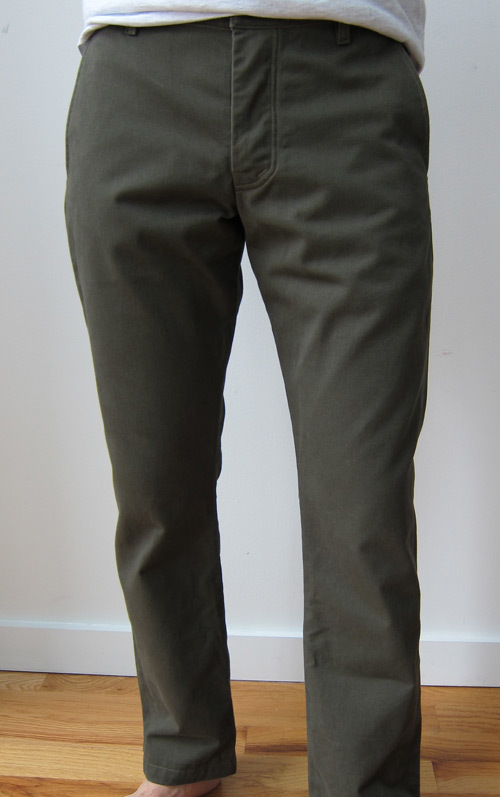 With the exception of a few minor changes, this pattern is identical to the first pair of chinos I made earlier this year. 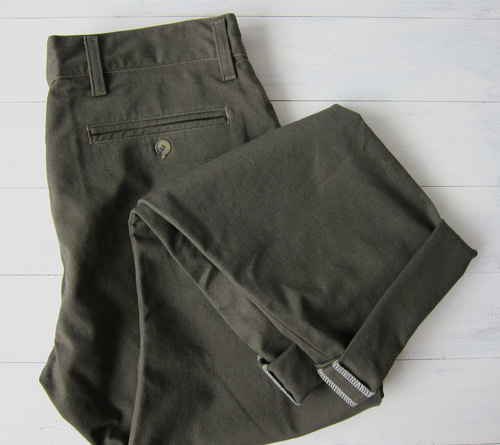 I’ve never been too wild about olive colored pants, but this fabric has just enough gray in it to make this color one of my new favorites. While they appear to taper quite a bit, I think this is just my stance in this photo. For the most part, the pattern is cut fairly straight. Now I just need to make two or three more pairs in other colors. I never thought twice about where my clothing came from until I started learning how to make my own clothes. Now I can’t help thinking about how many people are involved, factory conditions (good or bad), and fair wages every time I pick up a piece of clothing. While I am buying less clothing from stores these days, I still think about where the fabric comes from that I use in my projects. I wish there was an easy way to know whether or not a particular company or fabric mill treated their workers and the environment with respect. 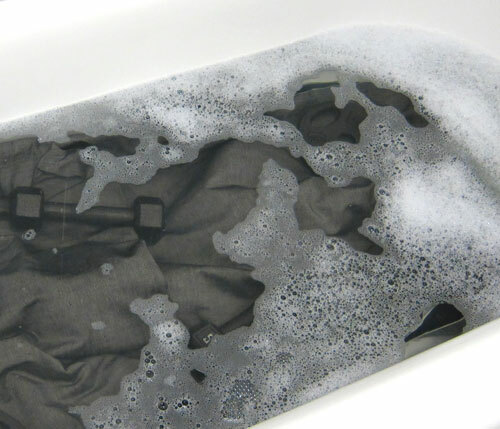 It would also be nice to know about any hazardous chemicals used in the finishing process on certain fabrics. 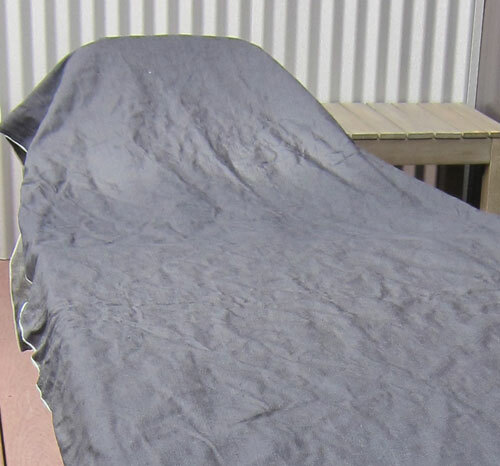 After reading about the formaldehyde used in non-wrinkle fabrics, I wish there was more transparency in how textiles are made. 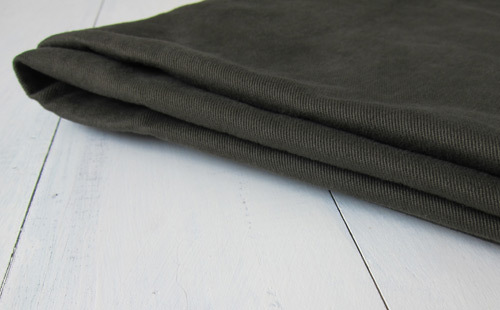 I would love to know if anyone has suggestions for places to buy fabrics made by reputable companies that have environmentally friendly manufacturing policies. I took a couple of cross country trips in June and found myself in need of a simple laptop sleeve that would protect my computer while riding around in my carry-on bag. 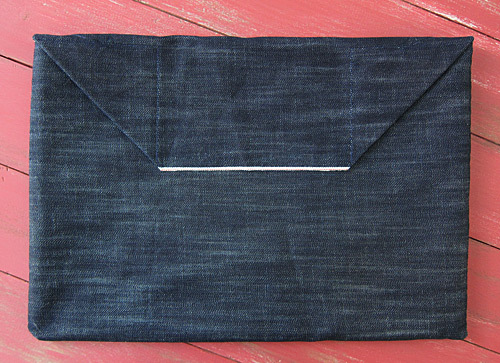 Since I had a ton of denim scraps lying around I threw together this selvedge denim laptop sleeve. 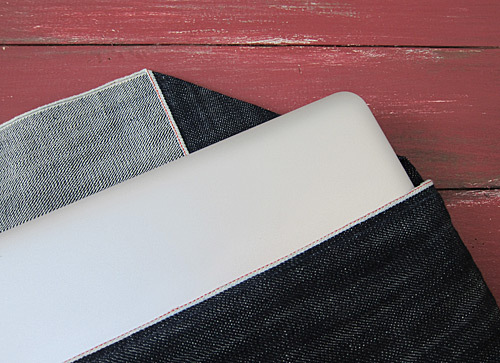 There are several companies that make and sell denim laptop sleeves, but most of them open on the side and do not offer a way to completely close the sleeve. Instead, I opted for an “envelope” style sleeve that allows me to tuck in the flap, which closes the sleeve and offers a little more protection. 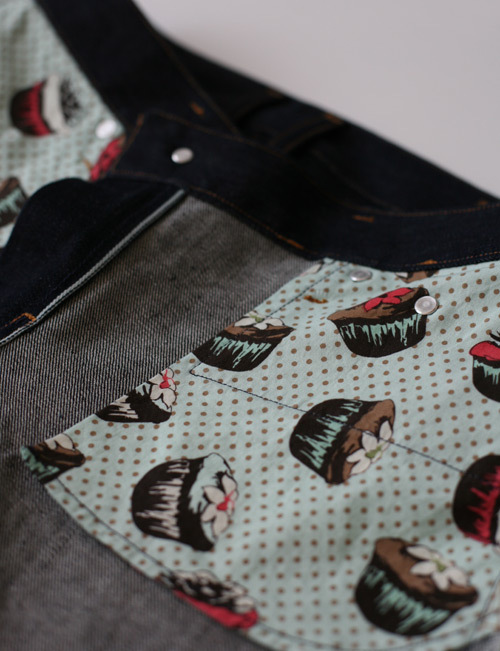 The inside is lined with a double layer of black corduroy fabric that was also laying around in my stash. While it didn’t turn out exactly as planned, it is perfectly functional and served its purpose as I was on and off planes, taking face plants on the tarmac (I have scars to prove it! ), and running across airport terminals. I am giving denim related projects a little break and moving on to something new. During the next couple weeks, I will start work on a men’s jacket/blazer, which might just be my most ambitious project yet. I’d like to make a somewhat lightweight, unlined or partially lined casual jacket for fall. As of right now I’ve decided to stick with cotton for this first jacket and will most likely use a twill, duck canvas, or maybe even corduroy. My initial plan is for a single breasted, two button jacket with patch pockets. The pattern will definitely take a while to complete, which is why I’m starting now if I want to have it ready by the fall. I’ve had some trouble finding decent resources for men’s tailoring methods. 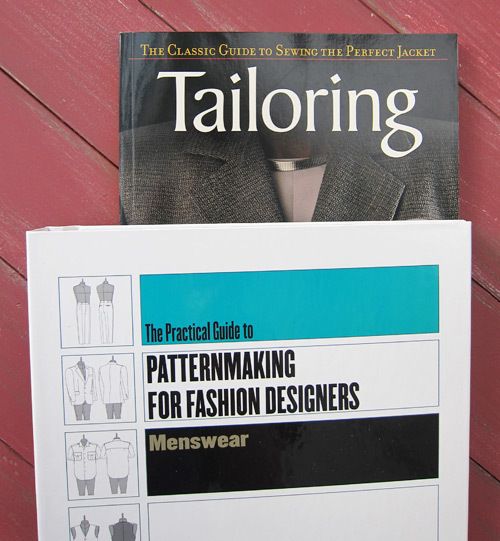 I have my pattern making book to help out with the pattern and a tailoring book pictured below, which should help some with jacket construction, but wish I could find more resources. The tailoring book is actually for women’s jackets, and while I’m sure a lot of the construction is the same, I wish I could find something more specific to fitting men’s jackets. Eventually I hope to turn this pattern into a more formal sport coat and even a jacket for a suit. 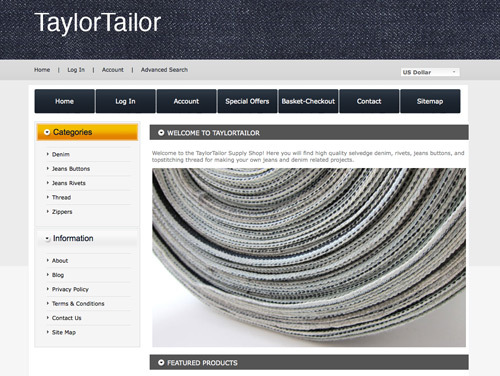 I am excited to announce the new TaylorTailor Supply Shop! The new shop is easier to use and navigate than the previous version with more products to choose from. I have added more top stitching thread colors, denim zippers, two new finishes for rivets and jeans buttons, and two new selvedge denim options with more on the way. When I first started making my own jeans I found it difficult and time consuming to source high quality materials and hardware for my projects. Based on the number of questions I receive inquiring about where to find these supplies, I realized that there is a need for a one-stop-shop for high quality denim and jeans related sewing supplies. My goal for the Supply Shop is to put all of these materials and hardware in one place, making it convenient for people to purchase them in small quantities. Who needs 25,000 rivets for one pair of jeans anyway? 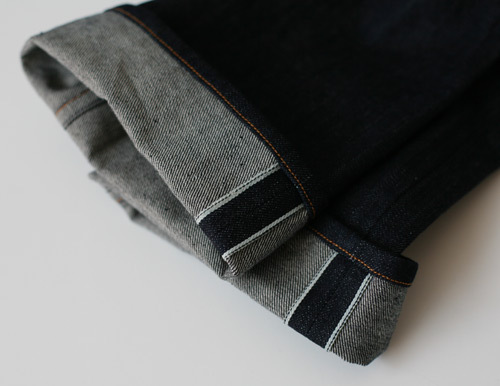 With the exception of pocket lining, (which I may eventually add) you can find everything you need to make a pair of jeans in the shop. Feel free to let me know if you have any questions about these products or the website. All of the denim, thread, and notions I carry are things that I use myself and completely stand by. If there is something that you don’t see that you would like to request for the shop, please let me know. I would love to hear your feedback and I am open to suggestions and ideas. 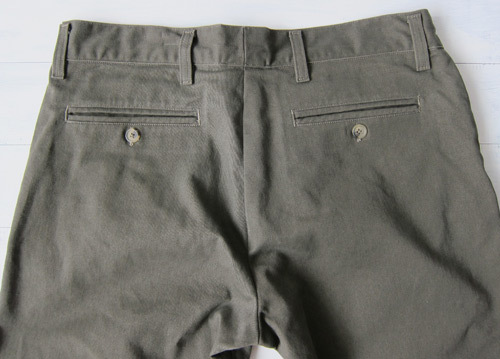 Just in case you were wondering, the easiest way to get into a girl’s pants…is to make her a pair. 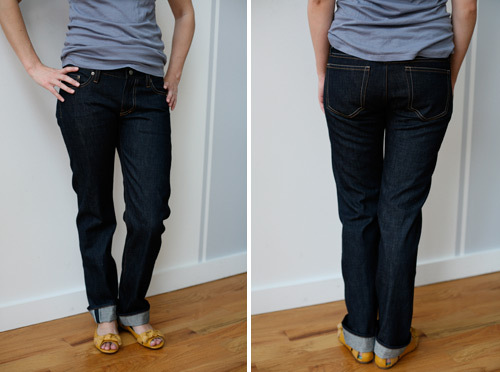 For the past few months I’ve been working on a pattern for a pair of selvedge denim jeans for my wife Lindsay. After she saw how awesome my jeans turned out, she has been coveting a pair for herself. Three test fit garments later and countless adjustments to the pattern, she finally has a pair of jeans. She wanted a slightly looser fit, which we are calling the “the husband” cut. 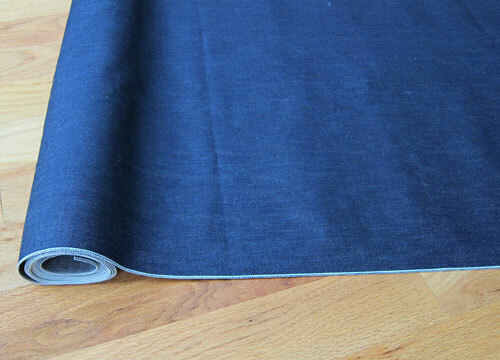 This was actually helpful when trying to preserve the selvedge on the side seam. Women have curves, which is a good thing of course, but they also present a challenge for novice pattern makers like me. 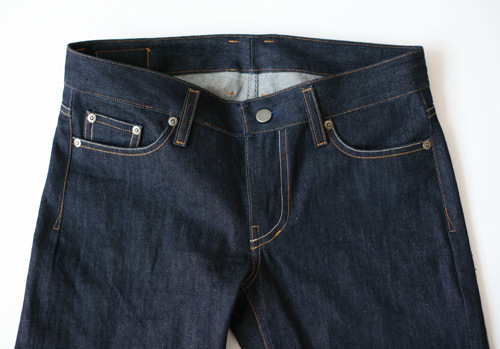 The jeans basically have a straight leg with a very slight taper on the inseam. 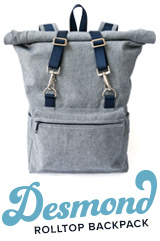 They feature two topstitching thread colors, a zipper fly, and hand-felled yoke, center back, and inseams. They are the definition of awesome. Yep, those are cupcakes on her pocket lining, which is completely appropriate if you know Lindsay. She is a cupcake queen, and our fridge is always packed full of amazing desserts that she makes from scratch. I am a lucky guy in more ways than one. You can read all about her/our culinary adventures on her food blog Love & Olive Oil. As she wears the jeans and the denim breaks in, I’m sure I will be making adjustments to improve the pattern for the next pair. I know this is a scary subject for some, but once you get the hang of it, I actually think installing the rivets and buttons is one of the easiest aspects of making jeans. 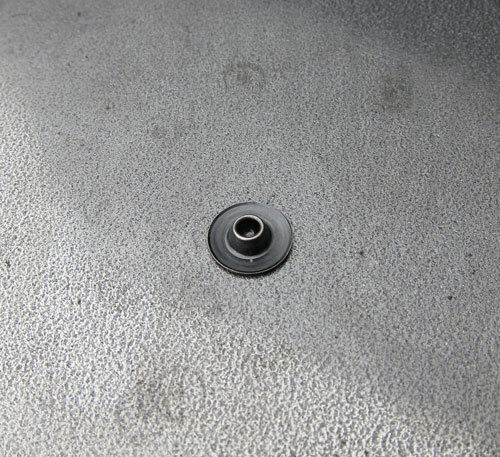 I installed a rivet in this example, but the steps and procedure for installing a button are exactly the same. Step 1. Gather all of your tools and supplies. I am using a piece of scrap denim for this example, but your jeans obviously need to be ready for the rivets. Installing the rivets and buttons is one of the last things I do. Step 2. Mark the spot where you want to insert your rivet. It may be difficult to see, but I marked a blue spot in the middle of the image above. Step 3. 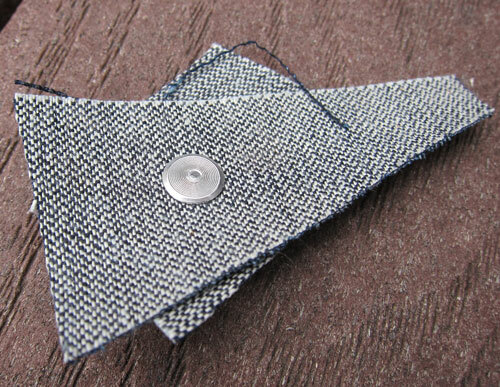 Determine how many layers of denim and pocketing fabric you will be inserting the rivet through. 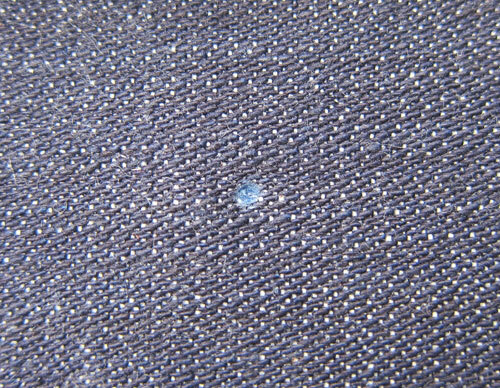 Depending on how thick your denim is, and how many layers you have in the spot where you are inserting the rivet, you may need to use some spacers. If the rivet is too long and you don’t have enough thickness, you can over pound the rivet, causing it to go in at an angle. This is bad, don’t do it. Your rivets may come out if they go in crooked. 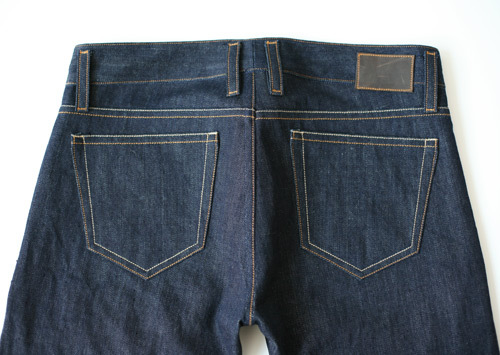 To solve this problem, you need to add two or three layers of denim on the back side of the rivet. You might be able to cut the rivet down, but I prefer to use spacers instead. 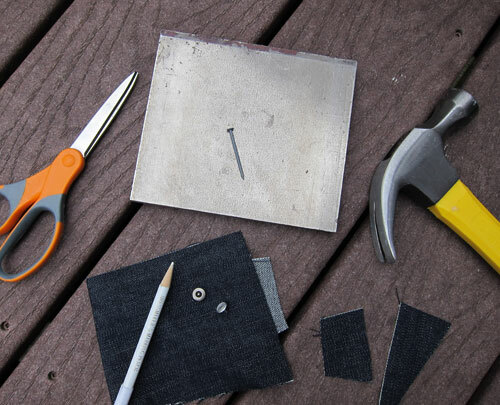 I am inserting the rivet through two layers of denim in the example, and decided that I need two additional layers for the back side of the rivet. Just use some scrap denim. Poke a hole using your nail (Step 4, below) and insert your rivet. 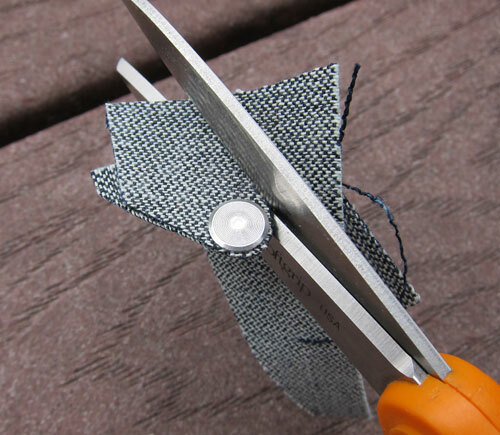 Then trim around the edge of the rivet head, eliminating the excess denim. Now your spacers are done. Step 4. 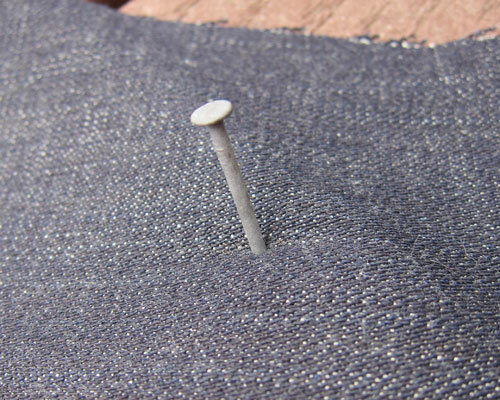 Poke a hole through your denim with your hammer and nail. You can use this same method to poke the hole for the spacers as well. Step 5. 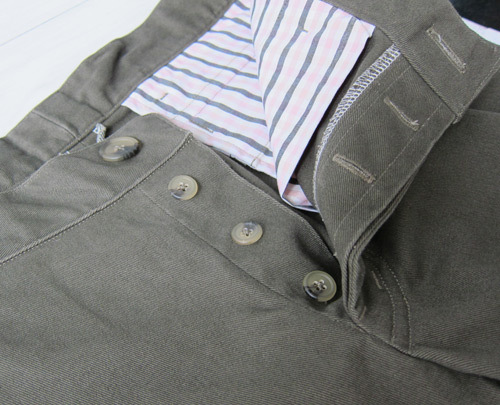 Insert the rivet (with spacers) through the back or wrong side of your jeans in the same hole you poked in Step 4. Step 6. Flip your rivet cap, or burr, upside down on your pounding surface. Step 7. 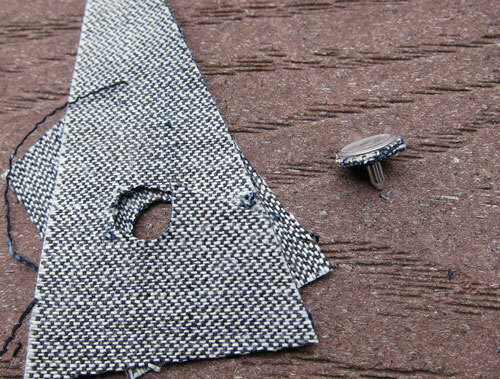 Turn the right side of the denim over, and align the rivet with the hole in the back of the rivet cap. The rivet cap is upside down under the denim above. Step 8. Lightly hammer the back of the rivet, but don’t pound it all the way in yet. You want to make sure that the rivet is going in straight. You should be able to pick up everything and check. The little bit of pounding you have already done should hold the rivet cap in place. Step 9. 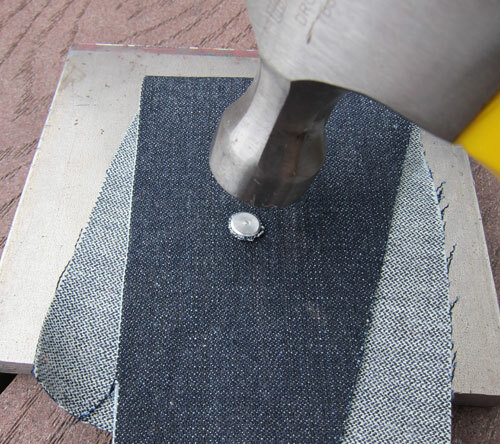 If the rivet is going in straight, then finish pounding it in until the rivet cap lays flat against the surface of the denim (on the right side). You really don’t need to pound that hard. Take it easy, rivets are your friend. 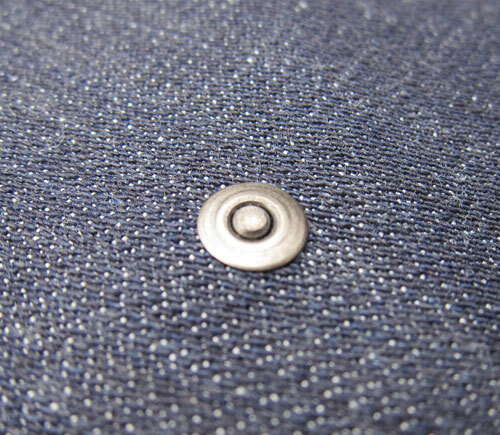 With regard to jeans buttons, you want to pound until the button no longer turns in place and feels solid. Tada, like magic. Finished rivet. I love starting new projects. 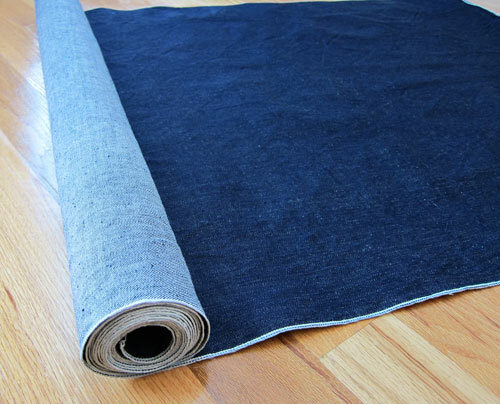 Raw denim, rolled out and inspected. Tossed in the tub for a soak. I feel bad holding it under the water against its will. Hung out to dry in the sun. Rolled back up, ready to cut. In case you missed it, here is a little interview I did with Peter from Male Pattern Boldness about denim and making jeans.